Here are 10 of my favorite frozen entrees from Amy’s Kitchen. These are helpful for busy nights! This delicious meal contains organic vegetables in a curry sauce of coconut milk and organic raisins, cashews and slivered almonds, combined with organic tomatoes and authentic hand-roasted Indian spices. Plus, it has golden basmati rice and dal. I like the pair this potato, peas and tofu wrap with a can of Amy’s Organic Light in Sodium Split Pea Soup to make a complete, 450-calorie meal. This gluten-free meal is so flavorful and fragrant. It has sautéed onions, broccoli, carrots, tofu and butternut squash in a coconut milk-based curry sauce. So good! 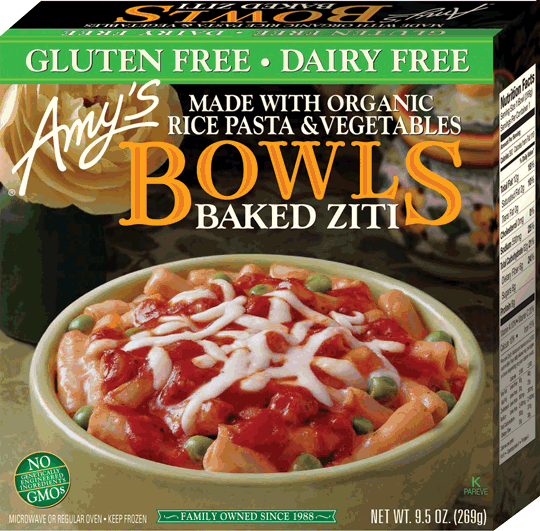 This pasta bowl is gluten-free AND dairy-free, making it ideal for those with intolerances to both offenders. The vegan cheese topping is a nice touch. Although I haven’t seen this one in most grocery stores (and it’s usually pricier than the other bowls), I love buying it when it’s available! It’s so flavorful and I appreciate the broccoli. Every ingredient is biodynamic & organic. As a kid, I loved lasagna, cheese and all. This version with Daiya Cheeze takes me back to childhood but includes a secret vegetable ingredient that I never used to eat – zucchini! 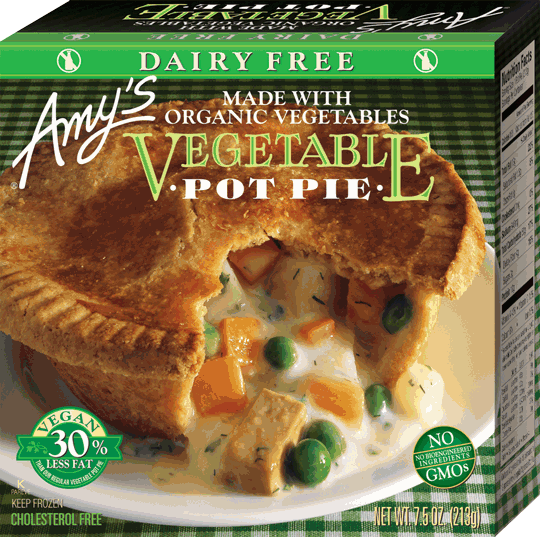 I haven’t eaten meat in more than 10 years, but I still get cravings for pot pies, so thank you Amy’s for having a vegan version that I can still eat! The tofu is a perfect replacement for chicken and takes me back to childhood every time. This pocket sandwich is just like the pot pie, but convenient for on-the-go. It contains a comforting blend of carrots, onion, peas, potatoes and tofu. I often eat this on its own as a light lunch, or pair it with chips, salsa and guacamole for dinner. The organic flour tortilla holds a combination of organic black beans and vegetables in a mild Mexican sauce. For a hearty and flavorful meal, this Tamale with Roasted Vegetables hits the spot. It contains black beans, zucchini, bell peppers, tomatoes, carrots, green chiles, jalapeno peppers and more. Aside from being vegan, all of these products are non-GMO and all-natural, as well! Have you tried any products from Amy’s Kitchen? Which are your favorites? Images via Amy’s Kitchen website. Some of my fav frozen products. I only buy them when I’m traveling, but they are tasty!